I ♥ Motherhood: Chicken Soup for the Soul (and to make you feel better when poorly...)! Chicken Soup for the Soul (and to make you feel better when poorly...)! 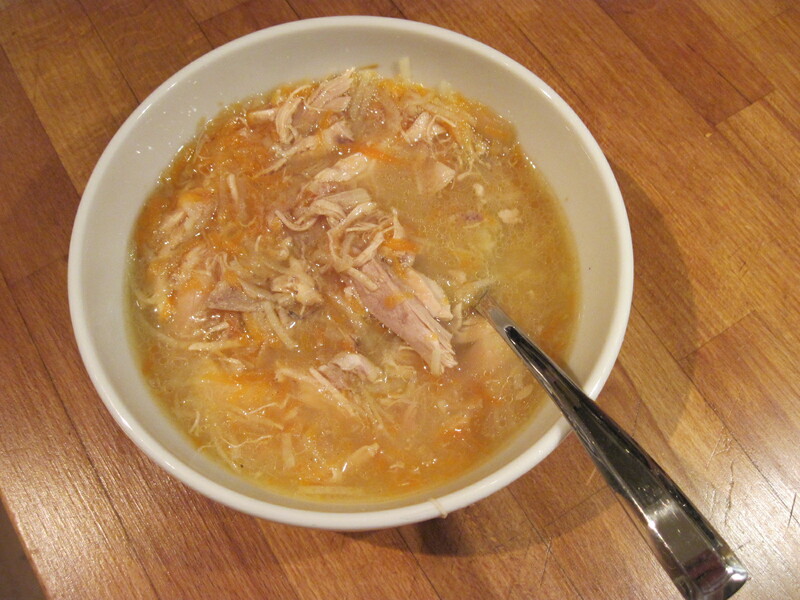 A few weeks ago when I was feeling a bit under the weather I knew that what I needed most was Chicken Soup! Luckily we'd only had roast chicken the day before and I'd got the carcass in the fridge and so I stuck it in a pot, covered with water, chucked in half an onion, half a carrot, peppercorns and a bouquet garni and made some stock. Strictly speaking I don't know how long you should simmer the chicken carcass for but I usually just use my own judgement and it probably ends up being at least an hour and a half. The house ends up smelling a bit 'chickeny' but it gets your taste buds going! Once the stock is made I drain it carefully ensuring there are no bones left lurking in the soup. Then I strip the meat from the bones. Next I get the food processor out and grate a couple of potatoes, a couple of carrots and an onion and then bung them in the chicken stock along with the meat. I season with salt and pepper (I like white pepper for soups - nicer flavour) and then let it cook for about half an hour until the veg is cooked and voila you have your chicken soup. Best eaten with big hunks of crusty white bread (and extra white pepper)! I definitely felt so much better after eating a bowl of this and it also makes me feel better to know that I've made something wholesome and used up all the leftover chicken! Drooling that looks so good.